Some of the most spectacular volcanoes on Earth are associated with subduction zones! 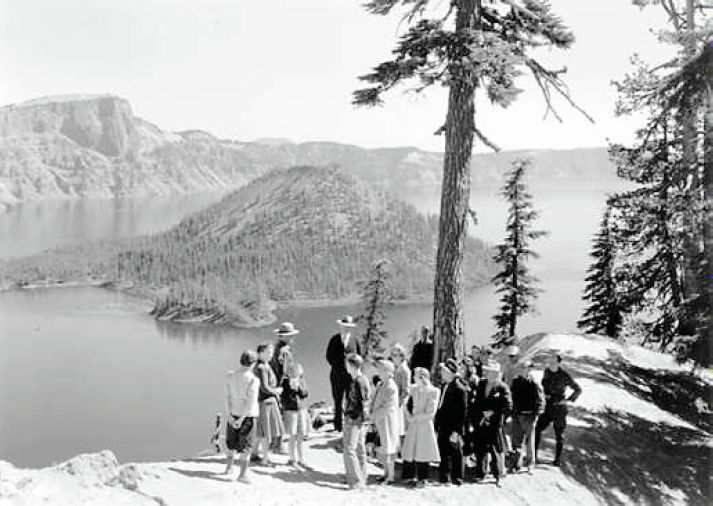 Right: The upper picture was taken at Crater Lake in 1941. Left: Mt. 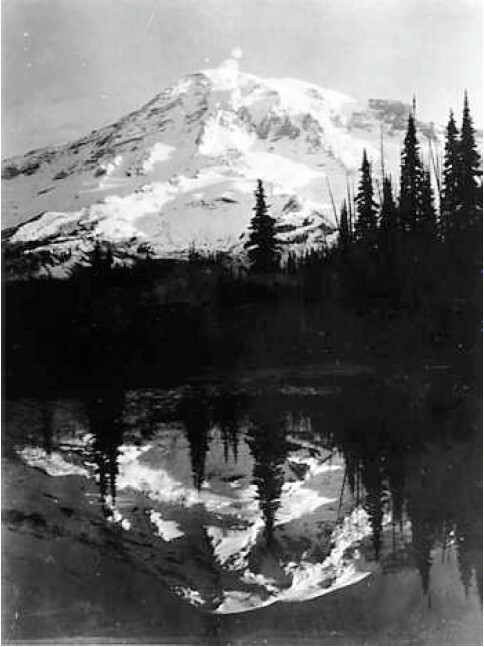 Ranier in 1914. A subduction zone forms when continental crust and oceanic crust collide. The continental crust is thicker and more buoyant than the oceanic crust so the oceanic crust subducts beneath the continental crust. As the plate sinks deeper, it can reach depths of 50 to 100 miles (80-160 kilometers) were it is so hot that the crust releases fluids trapped inside. The fluid melts some of the silica -rich minerals in the overlying material producing dark, silica-poor basaltic magma . The basaltic melt migrates upwards and becomes more silica-rich it melts its way toward the surface. Sticky, silica-rich magma erupts at the surface forming steep-sided volcanoes. Subduction zones produce volcanic arcs, curving chains of steep-sided volcanoes, for example the Aleutian Islands in Alaska. Volcanoes associated with subduction zones generally have steep sides and erupt explosively. Why are the subduction zone volcanoes so steep? The lavas erupted there are rich in silica. Silica acts as a thickening agent (like flour in gravy) so silica-rich magmas are thick and pasty. When the magma erupts, the lava is so thick that it can’t flow very far. Instead, it sticks to the sides of the volcano forming a tall, steep-sided cone. Sometimes these volcanoes explode (for example, Crater Lake, Mt. St. Helens, Lassen, and Mt. Ranier). Thick silica rich magma does not release the gasses very easily so they build up inside the magma chamber . As the gasses collect in the magma chamber, the pressure rises. It is possible for the pressure to rise so much that the chamber cannot contain the magma and it erupts explosively.